Kitten with a Whisk: Meatloaf: Love it or Hate it? 1. In a sauté pan over medium-high heat, sauté peppers, onion, and mushrooms in oil/butter. Season with salt and pepper. Sauté until they start to soften, about 5-7 minutes. Remove from heat and allow to cool. 2. In a large mixing bowl break eggs and lightly scramble together. To the bowl add ground beef, Italian seasoning, seasoned salt, Worcestershire, garlic, bread crumbs, parmesan cheese, and cooled veggies. Mix with hands until combined. 3. Put meat mixture into a loaf pan (mine is 9x5 I think) and press down to remove any air pockets. Bake at 350 for 1 hour and 15 to 1 hour and 25 minutes. (Temp should read 160 when cooked through.) Let meatloaf stand for about 10 -15 minutes before serving. *You can use chicken or veggie broth if you want to serve this gravy with chicken or turkey. 1. Sauté mushrooms and shallots in 1.5 tablespoons of butter over medium heat until softened. About 8-10 minutes. 2. Next add remaining butter. Once melted, add flour and whisk together. Allow to cook for 1-2 minutes. 3. Add beef broth to the pan and bring heat up to medium-high. Whisk flour mixture into beef broth and bring to a low simmer. Add salt and pepper to taste. Reduce by 1/3 and then remove from heat. Thoughts: I only call this Yankee Meatloaf to distinguish it from the other versions I make from time to time. And this was the first time I paired it with the mushroom shallot gravy. The meatloaf is perfectly delicious on its own, but I wanted the gravy for the mashed potatoes and it was fantastic over the meatloaf as well. The meatloaf had a lot of flavor, was very moist, and had a nice little brown crust on top. Which is totally one of my favorite parts of the meatloaf! I originally made this gravy to dress up some boring pork chops and instantly fell in love with it. It was great on pork (really great on meatloaf), and would also work great with chicken. Such a simple sauce, but so versatile. It’s quickly become one of my go-to’s. My husband claims that he doesn't like meatloaf, but then every time I make it, he devours it! This sounds wonderful, especially with that gravy. deborah - that makes me LOL. That actually looks quite tasty. As a single guy I don't do a lot of cooking, but I may have to give this recipe a shot. the thing i love most about this recipe is that there is NO ketchup in it! It looks phenom! 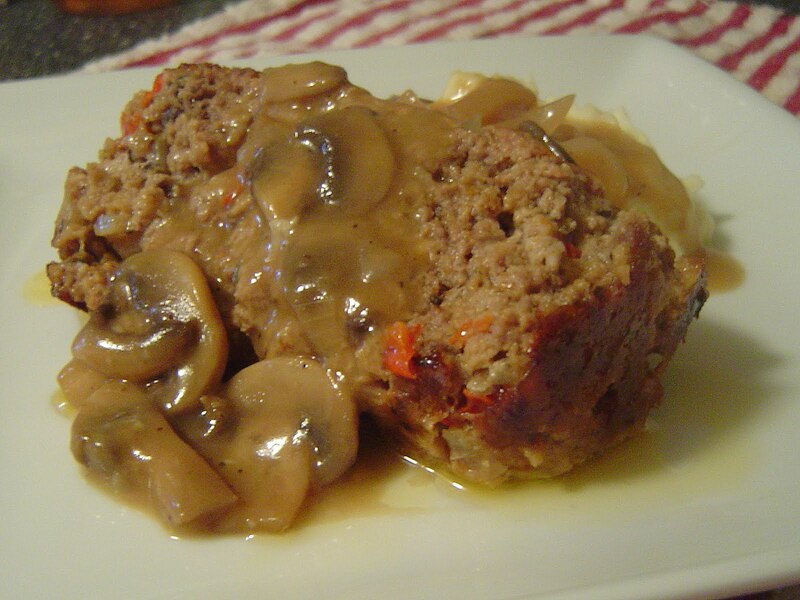 i love a mushroom gravy on my meatloaf too! ohh i might have to try this one soon.. you got me hooked! Funny! I will eat a meat ball but meat loaf is too much for me to take in...its hard for me to eat anything that describes the shape! However I may have to try your recipe b/c you claim it isnt "loafy" LOL! @ALaG - I know other people that dislike meatloaf and meatballs for the same reason.